In my failure biography on this blog, I describe my first psychotic experience in 1999 in New York City. Twenty years later after a lot of psychotherapy, medication, vocational and family support I am very lucky to have not ended up on the streets of New York City without food, clothing and shelter. In this blog post, I would like to share some of the amazing work of the Bowdoin alumni I am grateful to know who swiftly saved me during my medical emergency. Marc Wachtenheim, Founder and CEO of W International based in Washington DC and a member of the Class of 1997 was the first person to call and alert my father in the early morning hours in The Netherlands when I experienced my first psychotic episode in New York City. Marc and I have remained in contact over the years and he has been a mentor to me and gracious host during many of my subsequent visits to Washington DC. The video below is Marc speaking about human rights at the Oslo Freedom Forum. Eddie Lucaire, Vice President of Brand Partnerships at Copa90 and a member of the Class of 1999 walked me to Bellevue Hospital in Manhattan where he assisted in voluntarily admitting me for emergency psychiatric care. At the time I did not know where or why I was going to the hospital but thanks to Eddie’s good guidance I was safely given the treatment I needed. Eddie now lives in Los Angeles working for a start-up in the global soccer business and we have remained in contact over the last 20 years. Adam Stevens, Principal of PS 4 Duke Ellington School in New York City and member of the Class of 1999 was employed by American Express Corporate Travel Services in New York City. I was about to begin my first day in the same department of American Express with Adam, but did not make it to my first day of work. Adam also reached out to my father and family by sending them a fax in The Netherlands to let them know how things were going. Adam and I are not in frequent contact, but I know he is continuing to serve the common good through education. While I was in New York city, I had two roommates in Manhattan – Crispin M. Murira and Daniel P. Rhoda – who were working in investment banking for Credit Suisse First Boston. They too noticed the warning signs of my psychosis and helped work as a team with Marc, Eddie and Adam to get me the care that I needed at Bellevue Hospital and later at McLean Hospital in Boston. Sadly, in 2013 Dan passed away due to an unknown reason but I was able to attend his funeral in Houlton, Maine. Today, Crispin is the Co-Founder and CEO of Copia Global which leverages technological solutions for bottom of the pyramid customers in Kenya (see video below). The reason I share this true story is not only to express my gratitude, but to assist with fundraising for Bowdoin College and the National Alliance on Mental Illness (NAMI) both of which I contribute to in meaningful ways. I hope readers of this blog post will feel moved to make a contribution to these mission-driven organizations. Ever since I can remember I’ve always been a kinesthetic learner which is perhaps why I ended up completing my graduate degree in Physical Education. I missed out on having an older brother as a kid, but I am super proud of John “Jay” Morrison, my elder brother-in-law who completed the 2018 TCS New York City Marathon recently in over 4 and half hours. Respect to anyone who completes the 26.2 miles of a marathon. 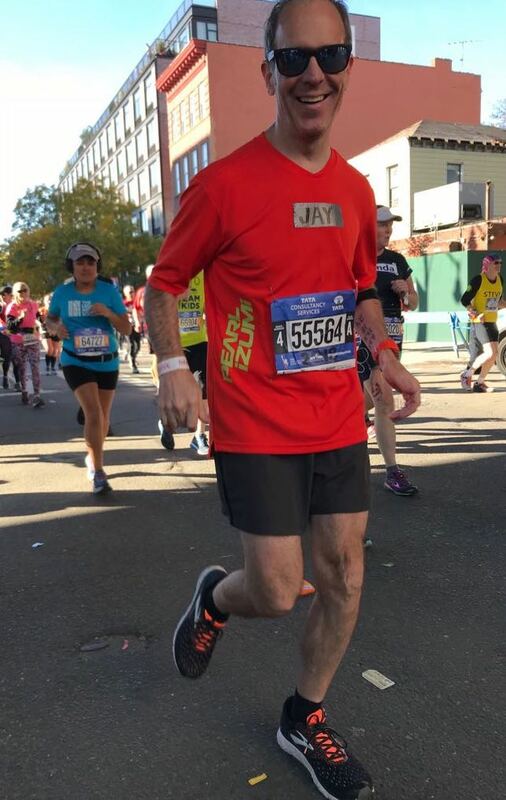 John “Jay” Morrison, my brother-in-law completing the 2018 New York City Marathon. Photo credit: P. Mohammed, 2018. While I am yet to run a marathon myself, the preparation and training before to qualify and compete in a marathon is not only a physical but mental challenge. Jay was a recreational ice-hockey player in his youth and became a fan as a season ticket holder of the men’s ice hockey program at University of Denver (his alma mater). He is also a golf and skiing enthusiast. His interest in athletics did not stop him from staying physically fit and maintaining a balanced diet (which he learned how to do as an award-winning chef). Currently, Jay is leading a busy life in the food distribution business, but he still finds time to keep fit even though he recently turned fifty! 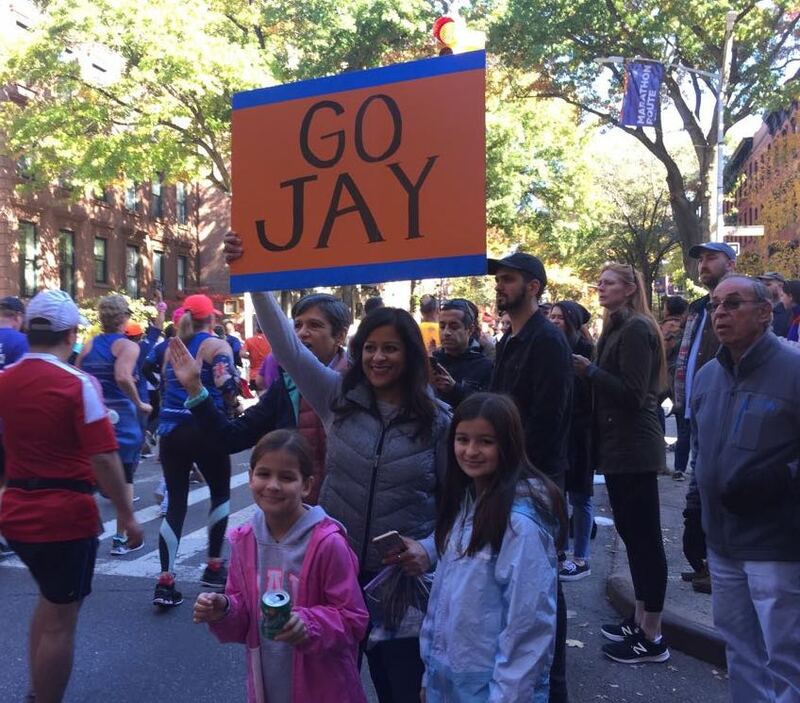 Miriam (my sister) and Meena and Anjali (my nieces) cheering on Jay at the New York City Marathon. Photo credit. P. Mohammed, 2018. What can we all learn from my brother-in-law Jay? Well, he is a great example of an American male who is aging well by staying physically and mentally active. Jay did not specialize in sport but is a well-rounded athlete who is sharing his sporting lessons with his young daughters and wife. Perhaps the most important lesson we can learn from Jay is to keep on moving and learning new things. Whether you are in third grade or a senior citizen, maintaining physical and mental fitness throughout one’s lifespan is worth it! I recently safely returned to the United States from a vacation in Kerala, and learned that today is the International Day of Charity which is observed by the United Nations member states. During my extended stay in Kerala, the state faced unprecedented floods (yes, climate change is real) that caused immense damage to its people, economy and infrastructure. Fortunately, my maternal family members were not severely affected by the flooding. Several cousins did however, mobilize resources with local organizations to assist with the flood relief by distributing food, clothing and care packages as well as organizing fundraising events for flood victims. 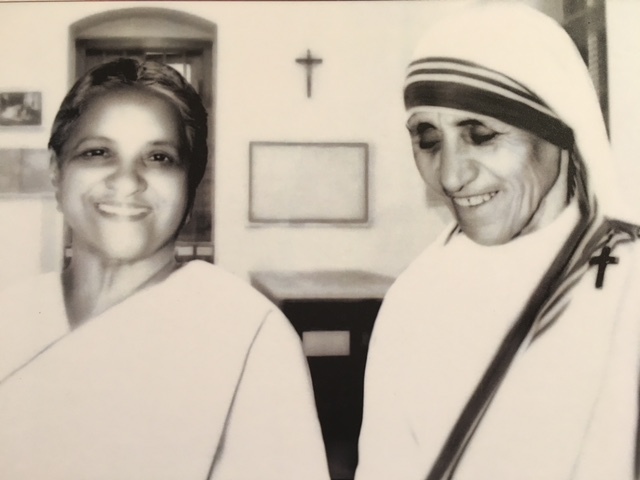 Mother Teresa and my maternal great grandmother of the Kuruvinakunnel family in Kerala, India. Photo Credit: Unknown. I am proud of my Kerala family tradition of leading in social and philanthropic causes, beginning with my great grandmother from the Kuruvinakunnel family (my maternal grandmother’s mother). Above is a picture which Mary Michael, my maternal grandmother shared with me while we were housebound due to landslides. The photo is of Mother Teresa during one of her visits to Kerala and my maternal great grandmother. During the summer of 2012, I was fortunate to make a 3-day visit to the Mother Teresa Center of Calcutta to assist with social service activities. The purpose of my trip to Southern India, and Kerala in particular, was to visit my maternal elderly grandparents, Michael Kallivayalil and Mary Michael and other relatives. Upon returning to the United States I created a video slideshow to remember my visits to Peermade, Kerala and Bangalore, Karnataka which were among some of the places I traveled through. Joseph Michael Kallivayalil, (Managing Director of Glenrock Rubber Products Pvt. Ltd), my uncle is an avid golfer so there was a great day spent together on the Peermade Club golf course, despite the calamities caused by the flooding in nearby districts. This visit made me realize there is potential for sport tourism in Indian states like Kerala. Nonetheless, Kerala faces an uphill task of rebuilding its infrastructure and economy as well as rehabilitating people severely impacted by the flooding. As with many humanitarian disasters the coordination amongst government, business and civil society actors “on the ground” is critical for efficient and effective reconstruction. Building on the momentum of the goodwill shown to Kerala by its diaspora and well-wishers, those ordinary citizens of Kerala who lost everything including their homes, livelihoods and sense of well-being must not be ignored and forgotten by the media, local, state and federal relief agencies and the private sector. On, June 5, the international community will celebrate 2018 World Environment Day to encourage businesses, governments and individuals to safeguard the planet with the “Beat Plastic Pollution” campaign. Regardless of where one happens to live in the world, the impact of climate change is real and the need for humans to protect themselves and adapt to climate change is important. In the spirit of Arthur Ashe, who was once quoted as saying “start where you are. use what you have. do what you can,” or in other terms, acting locally while thinking globally. 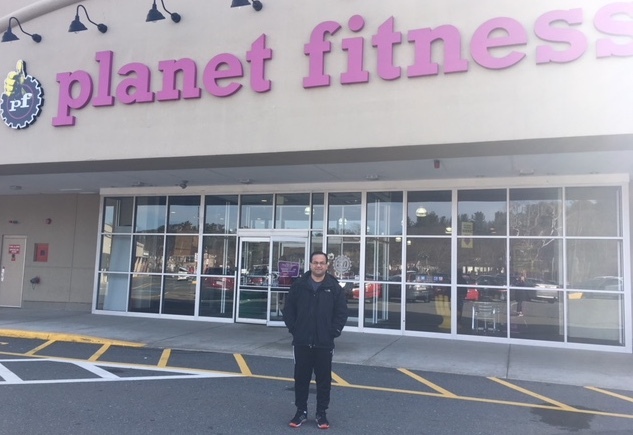 As part of my weekly activities, I enjoy regularly working out at the local Planet Fitness gym in the Town of Andover, Massachusetts. Though there are no squash courts at the facility or group exercise classes, it provides a “judgement-free zone” for general strength and conditioning. At entrance to Planet Fitness in Andover, Massachusetts, 2018. Photo credit: Planet Fitness staff. When I don’t have access to a car or the weather is reasonably good, I like to walk to the gym. Striving to being smart and green on an individual level can feel like a drop in the ocean, however if there were a critical mass of individuals doing this then the impact on the environment would be less damaging. As a multinational business, Planet Fitness positions itself as an American franchisee of fitness centers however it could do more by partnering with other environmental groups, such as the Green Sports Alliance, and promote better nutrition by serving healthy snacks, like fruit cups during its community membership activities. Meanwhile, the Boston squash community has stepped up its game in the arena of sport and environmental sustainability. In September, 2014 Sydney Soloway, a Dana Hall School alumnae founded a wonderful environmentally friendly initiative called Squash Cares, a nonprofit, squash ball recycling program to benefit people with disabilities specifically, autism and ADHD. The concept of keeping old squash balls out of landfills is a very practical environmental solution for a sport played in more than 145 countries. Any high school or college squash program in the world should take note of Squash Cares, as an innovative squash ball recycling program benefiting people with disabilities. While there is no better substitute for in-person mentoring for both the young and old, the Internet and social media enables online or digital mentoring. This blog post is aimed towards younger readers and experienced educators. Twenty years ago (during my junior year), I was invited to a Bowdoin alumni event where I had the good fortune of being seated at a table with President Emeritus Robert Edwards of Bowdoin College and other distinguished alumni. The purpose of the “Beneath the Pines” event was for students, staff, professors and alumni to share ideas on what Bowdoin as an institution was becoming and how campus constituents could shape the future direction of the College. I learned from fellow students about President Edwards’ prior work experience with the Aga Khan Development Network (AKDN) and was curious to learn more from him. At the dinner table, we discussed a number of issues concerning the future of Bowdoin College ranging from student life to academics. Following a lively discussion, the elders at the table turned to the youngest person at the table and asked me, “what are your plans for the summer?” With nothing to lose, I expressed my interest in securing an internship with the Aga Khan Foundation USA based in Washington, DC. President Edwards immediately noticed my interest in the work of the Aga Khan Development Network and graciously invited me to his office to discuss his work with the organization. A few days after our meeting I prepared my personal statement and was interviewed by a committee of AKF USA staff and volunteers for a paid summer internship position. At my internship desk at the Aga Khan Foundation USA office, Washington, DC. Photo credit: N. Karim, 1998. From the moment I learned of my acceptance to the AKF USA internship program, I was absolutely thrilled to take steps towards a career in international development. The content of the undergraduate internship varied from assisting in several aspects ranging from the Foundation’s communications, outreach and public education to assisting in maintaining and organizing the Foundation’s library, documentation and communication materials. Patricia Scheid, our internship supervisor at AKF USA was an excellent guide, facilitator and mentor who made our internship experience more than “just filing” to assisting in grant writing, event planning and community outreach. Also as interns, we were introduced to other members of the AKDN, U.S. Federal agencies and civil society organizations based both in Washington DC and around the world. AKF USA Interns: Nadya (left), Tariq (center) and Shalini (right), Washington, DC. 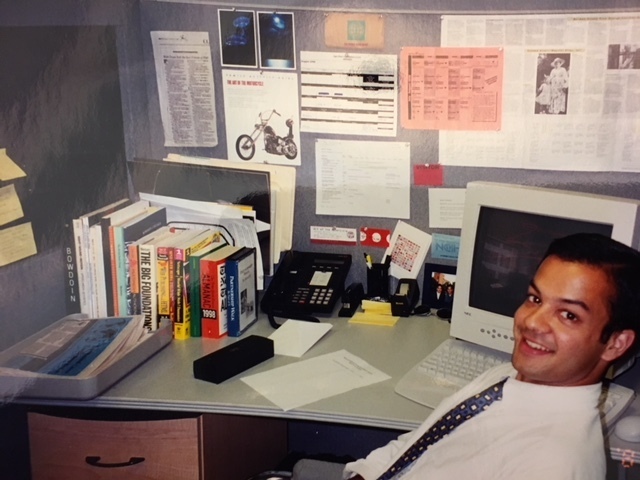 Photo credit: Z. Hemani, 1998. 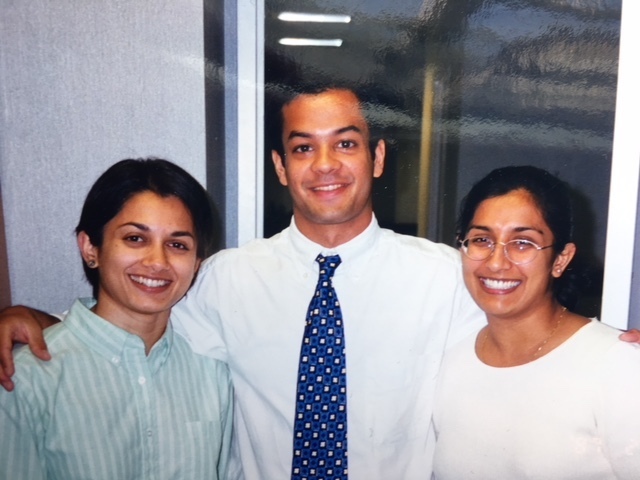 While career trajectories are not always linear, my AKF USA internship was a fantastic foray into the role and effectiveness of foreign aid in improving the quality of life of individuals and communities around the world. A lot has happened over the last twenty years in my career development, as well as in the field of sustainable international development, but I am hopeful that the next twenty years will also be just as exciting, if not more both personally and professionally. Thank you to President Emeritus Robert Edwards of Bowdoin College and the Aga Khan Foundation USA for my transformative internship experience. I hope younger readers and experienced educators will be encouraged by the power of networking, mentoring and leadership development to transform lives. The Boston Public Library and WorldBoston, both forward thinking organizations hosted and organized an important event to raise awareness of the role of diplomacy in enhancing American global leadership. Since the end of the second World War, the United States has led the world in military, economic and cultural power, yet the change in today’s global trends – the rise of China, geo-political challenges in Europe and shifting economic tides, gave the speakers an impetus to call on the American public to improve the state of the U.S. State Department. Building on Ambassador Barbara Stephenson’s compelling column and Ambassador Nicholas Burns’ alarming op-ed piece in the New York Times, their remarks at the Boston Public Library made a strong case in opposition of the 30 percent budget reduction to the U.S. Department of State by the Trump Administration. Ambassador Stephenson outlined the role of American diplomats, their strengths and what happens when diplomacy is done well – in terms of “invisibility and light touches,” while cultivating relationships to better negotiate international agreements and treaties. For example, the Northern Ireland Peace Process and the Good Friday Agreement where community-based policing transformed relations between Catholics and Protestants. Ambassador Stephenson and Ambassador (Retd.) 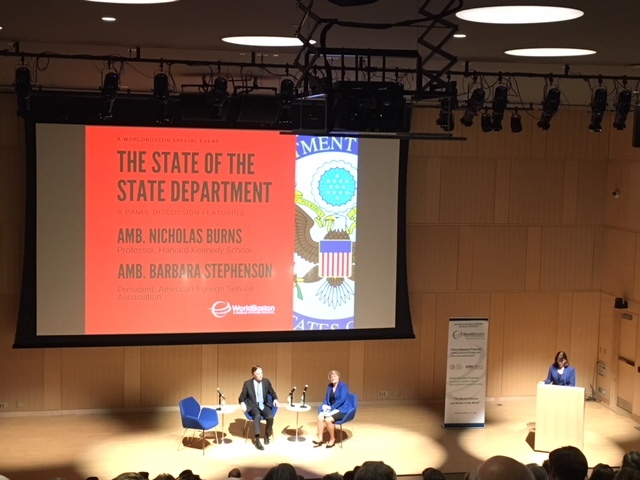 Burns on the “The State of the State Department,” moderated by Mary Yntema, CEO of World Boston at Boston Public Library, February, 2018. Photo Credit: T. Mohammed, 2018. Ambassador Stephenson closed her remarks by asking what happens when American diplomats are not stationed overseas? Her unequivocal response, was that without the presence of American diplomats, there is a void in the relationship between the United States and the host countries, there is a lack of intelligence or “eyes and ears” on the ground and it is difficult to deal with threats to U.S. interests. In short, Ambassador Stephenson emphasized that the budget cuts were not plausible and not sustainable for American global leadership in the world. Ambassador Burns, a Massachusetts native began with how Boston, has always been an outward looking city with its seaport and trade relations with many countries. He went on to describe the extent to which the State Department budget cuts and the increase in federal spending on the Department of Defense was not prudent, nor wise. Ambassador Burns shared how the diplomatic corps and military personnel often share serving on the frontlines, therefore requiring better integration of State and Defense Departments. He provided examples such as Syria, Saudi Arabia, Germany and Korea – where there are currently no US Ambassadors serving to protect and advance U.S. interests – all of which face important, complex political, economic and security issues. Ambassador Burns closed his remarks with an apt quote by Winston Churchill during his 1943 speech at Harvard University, just as the British Empire was on the decline and America’s influence was improving, by stating “the price of greatness is responsibility.” For students, educators and practitioners I highly recommend learning more about the Boston Network for International Development, which is why I attended this educational event. To help prepare the next generation of students, researchers, educators and practitioners, I chose to volunteer my time with Boston University’s Campaign: Choose to Be Great! While my contribution was, albeit very small, in comparison to the over $1 Billion that was raised by generous alumni, parents and well-wishers, it was nonetheless good to be able to give back to the University. The faculty and students thanked donors, like me, by inviting us to a donor appreciation event. 2018 Boston University Donor Appreciation Event. Photo credit: T. Mohammed, 2018. 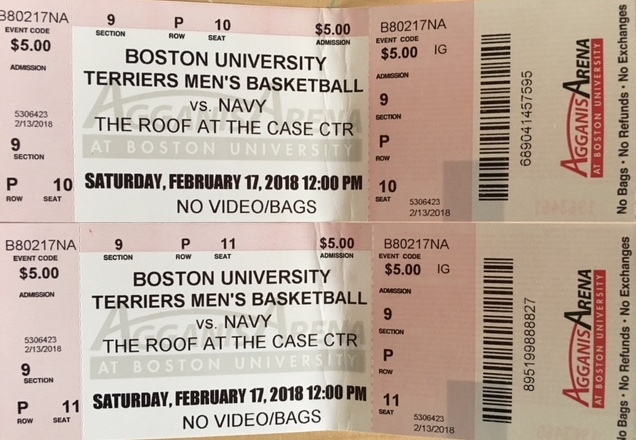 I’ve always wanted to watch a NBA game, but with the high cost of tickets and my lack of understanding for the game of basketball, I was pleased to be able to watch a Division 1 Men’s Collegiate Basketball game between Boston University and the U.S. Naval Academy. What made attending this event special was knowing that former advisors, classmates and colleagues who were collegiate basketball players would have also enjoyed being at the game. There were many benefits for Boston University as a means of showcasing itself and saying thank you to donors thereby engaging in positive educational stewardship. 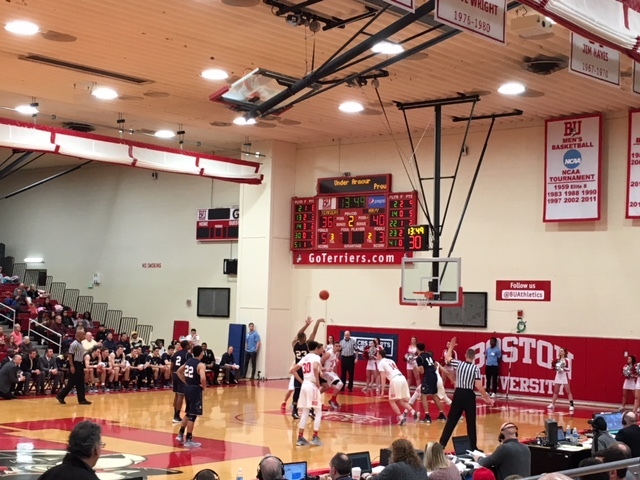 Boston University’s Men’s Basketball versus U.S. Naval Academy, The Roof at the Case Athletic Center. February, 2018. Photo credit: T. Mohammed, 2018. Through my volunteer work both in micro and macro settings, I have found that appreciation of those who do good work can improve the state of the world. Donors have different motivations for getting involved in supporting a cause therefore from a fundraiser’s perspective it is helpful to uncover the “why give?” After returning home from the event, I watched a TED Talk by Darryl Byrd about being an “aimless volunteer” who spread himself too thin with time and energy. He then decided to focus his volunteer work to get a better Return on Investment (ROI) for his volunteering. Whether volunteering time, advocating for a cause or writing checks, they all help advance a nonprofit’s mission. As we get older, the question becomes, which nonprofit matters to you the most?